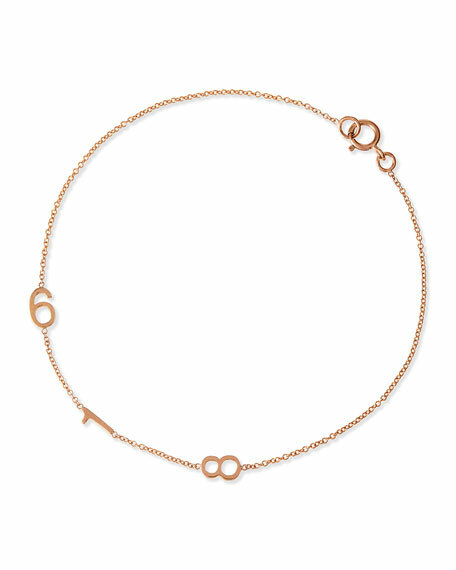 18-karat rose gold vermeil goes above and beyond the industry standard thickness to create an especially enduring gold plate. Circular pendant features single custom drawn, not computer generated, initial. Single G/VS white diamond; 0.03 total carat weight; 2mm. Small chain bracelet, 6 1/2"L. Lobster clasp. Made in USA. "Goldie" adjustable necklace by Kendra Scott. Plated brass in your choice of metal color. Integrated filigree curved bar station. Approx. "Goldie" adjustable necklace by Kendra Scott. Plated brass in your choice of metal color. Integrated filigree curved bar station. Approx. 4.3" circumference. Adjustable; slider clasp. Imported. Please note: Due to the one-of-a-kind nature of the medium, exact color patterns may vary slightly from the image shown.